An inmate who came within hours of execution in 2004 is asking Gov. Jerry Brown to allow advanced DNA testing of evidence that might clear him of the murder that landed him on Death Row, and he has found a new supporter in Sen. Kamala Harris, who opposed the testing when she was the state’s attorney general. 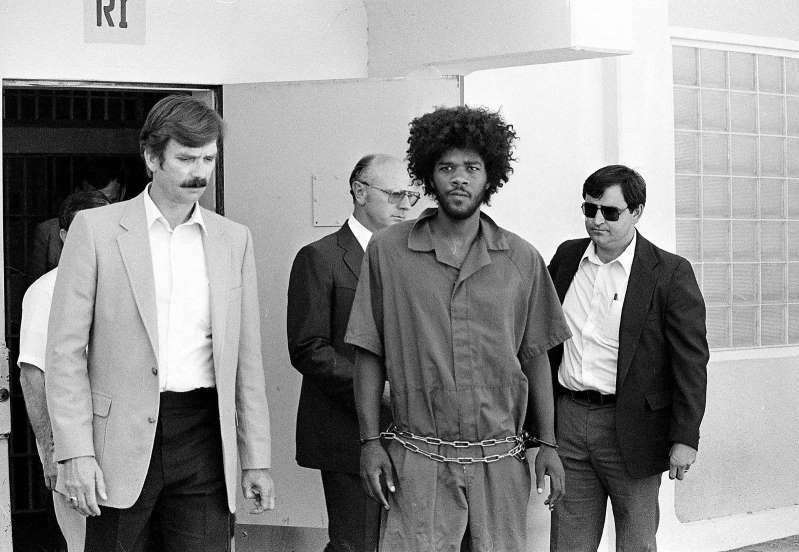 But Cooper, now 60, is one of more than 20 condemned prisoners in California who have lost the final appeals of their death sentences. Their cases are on hold while a federal judge in San Francisco considers challenges to the state’s untested procedures for single-drug lethal injections. But in light of U.S. Supreme Court rejections of similar challenges in other states, California may soon schedule its first executions since January 2006, unless the governor intervenes. Cooper has asked Brown to grant a reprieve — a postponement of his execution — and to order a new investigation of his case. It would include modern-day DNA testing of critical evidence: a bloody T-shirt found near the victims’ home, a hatchet, and hairs found on the victims that may have come from the killer or killers. The decision is solely up to the governor because Cooper’s case is no longer before the courts, although he could try to file a new appeal if Brown turned him down. His lawyers submitted the request in February 2016. It drew new attention Thursday when the New York Times posted a column that pored over the case and argued that Cooper had probably been framed. And on Friday he gained a new ally, Harris, who as attorney general from 2011 through January 2017 had the evidence in her custody and opposed new DNA testing. Norman Hile, a lawyer for Cooper, said he was “excited” by Harris’ stance. “We should not execute somebody who might be innocent,” he said. Brown’s press secretary, Evan Westrup, said the matter is still under review and did not indicate when a decision might be made. Such requests are “thoroughly and diligently reviewed,” he said by email. Brown personally opposes the death penalty, but he also said, while serving as state attorney general, that there were no innocent people on California’s Death Row. The murder victims, Doug and Peggy Ryen, their 10-year-old daughter, Jessica, and an 11-year-old houseguest, Chris Hughes, were hacked to death in the Ryens’ home in Chino Hills in June 1983. Cooper had just escaped from a nearby prison, where he was serving a sentence for burglary, and had hidden out at a home close to the Ryens. The Ryens’ 8-year-old son, Josh, was stabbed in the throat but survived. He later testified that he recognized Cooper as the lone attacker. But while being treated for his wounds in a hospital, he communicated to a social worker with hand signals that the assailants had been three or four white men. Cooper is black. A jury convicted Cooper after lengthy deliberations, and he was sentenced to death. Eight hours before his scheduled execution in 2004, the Ninth U.S. Circuit Court of Appeals called a halt and ordered DNA testing of the bloody T-shirt. Cooper’s DNA was found on the shirt, and his death sentence was reaffirmed. But in a 101-page dissent from the appeals court’s refusal to reconsider the case, Judge William Fletcher said the judge overseeing the test had refused to allow a defense expert to witness it and had discounted defense evidence of preservatives in the blood sample — an indication, Fletcher said, that officers had taken the blood from a lab in an effort to frame Cooper. He also said another potential witness had told officers that her boyfriend, a convicted murderer named Lee Furrow, who is white, had worn a T-shirt like the one found near the murder scene and had a hatchet that resembled descriptions of the murder weapon. Police retrieved a pair of bloody coveralls from Furrow but later destroyed them without testing them, Fletcher said. Four more judges signed Fletcher’s opinion, six issued their own dissents, and one dissenter said the actual vote for a rehearing was even closer on the 27-member court. But Cooper ran out of appeals when the Supreme Court denied review of his case. Hile, Cooper’s lawyer, said the request for new DNA testing has drawn support from the president of the American Bar Association, former state Supreme Court Justices Joseph Grodin and Cruz Reynoso, the law school deans at UC Berkeley, the University of San Francisco and Loyola, and, before his death in March 2017, former state Attorney General John Van de Kamp.